We all identify with some form of inertia of change, quite often in our lives. The comfort that familiarity of things extends, is incomparable and sometimes it takes a lot to step out of the cocoon of the comfort zone. Eleven year old, Ellie is experiencing just the same inertia when her life in middle school is turning out to be nothing less than overwhelming. 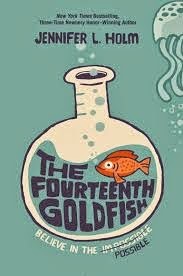 She misses everything about her fifth grade from her best friend Brianna to her dear goldfish. One fine day a strange teenage boy shows up in the house along with her mom. He is quite bizarre and authoritarian but strangely resembles her maternal grandpa Melvin, who is a scientist. Has grandpa Melvin actually found the secret to mortality? One can imagine how the narrative would progress when a septuagenarian mind resides in a teenage body. He needs to be driven to places, he needs to attend the middle school along with Ellie, but he also wants to pursue his research to make his scientific community recognise his discovery - worthy of at least a Nobel prize. But the problems are aplenty. His lab is no longer accessible to him and the lab's security guard will not allow any weird looking teenager near the premises. How will he get his sample from the lab refrigerator? He created this sample from T.melvinus, a unique species of jellyfish. The author Jennifer Holm has tried to work on various different themes through the narrative. The treatment has been light but some very relevant topics and issues are being discussed in the story - eternal desire to remain at the peak of one's life, harmonious separation between parents, single parent homes, changing equations among friends and friendships, identifying one's passion, school issues and so on. Ellie the protagonist is sketched as a believable character who seems to have adjusted well to her parents' amicably parted ways. While going through accelerated pace of changes in her own life post elementary school and understanding reverse changes in her grandpa; she gets introduced to her own natural passion for science. She starts enjoying the opening up of the whole new world to herself when she experiences science pervading every mundane stuff and activity. The highlight of the book is how Ellie progresses from being resistant to change to accepting the same graciously and finding it rather interesting. Being a sensible and sensitive girl, she realises how even her mother needs to move on from past experience and to open up doors to what new the life has to offer. She beautifully manages to convey to her grandpa the futility of his discovery, of holding on to one stage of life. Subtle mention of (im)mortality, life and death, fear of ageing - make the narrative quite rich at various levels, but all these are dealt with in such an unassuming manner that one tends to fall in love with how it is done. New body, old mind in one character of Melvin makes for a hilarious and interesting read - he fumes on the late return of Ellie's mother, spends extra time in bathroom, wears ponytail holders borrowed from his granddaughter, looks for acne cream in the bathroom, doesn't have to any old-age issues with his sight and teeth and so on.